Lying comfortably on the sofa in his dimly lit house, the comedian Bill Cosby seemed pretty relaxed at 7:45 a.m. on Oct. 25, his eyes half closed and his smile charming, as usual, even though five 3-inch-long needles were inserted into his head, eight 4-inch-long ones were in his round belly, and 10 3.5-inch-long ones protruded from his legs and feet. 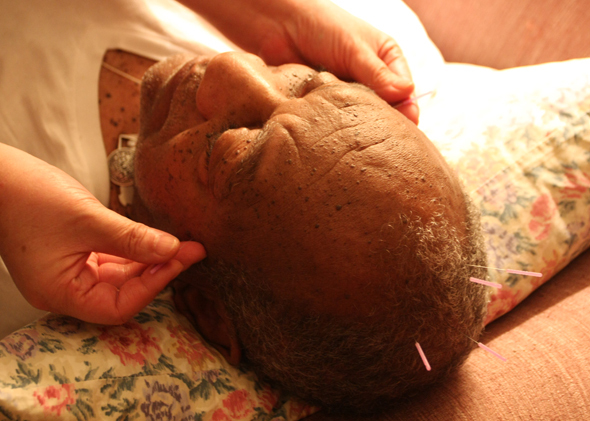 For Cosby, 74, this is his 20th year taking acupuncture. For acupuncture, this year marks the 40th anniversary since a New York Times correspondent introduced Americans to its benefits in an article titled “Now, Let Me Tell You About My Appendectomy in Peking.” Four decades later, however, many U.S. insurers still refuse to cover the procedure, and sometimes even the ones who do will try to avoid paying the bill, acupuncturists say. Part of the problem is that long-standing conflicts between the two biggest Chinese acupuncture associations — the United Alliance of New York State Licensed Acupuncturists and the American Traditional Chinese Medicine Society — have slowed the legislative process, said Dr. Tian, the first clinical consultant on acupuncture at the National Institutes of Health and a former member of the White House Commission on Complementary and Alternative Medicine Policy. “Why can’t Chinese acupuncturists stop wasting time on fighting each other and get insurance policy done?” Dr. Tian asked. The answer is complicated. The two groups have failed to merge, because their philosophies are different and they disagree about whether an older generation of traditionally trained acupuncturists are as qualified as younger, licensed practitioners trained in the United States. On one side of the question is Dr. Ming Jin, from Shanghai, the former president of the united alliance, a 300-member union consisting mainly of senior acupuncturists who barely speak English. She owns Ming Qi, one of the busiest acupuncture clinics in Manhattan, located at 161 Madison Ave., near the Empire State Building. Her clinic only accepts cash. Bill Cosby is one of her many celebrity patients. Her mentor, Dr. Jingyuan Ding, was the politically influential leader of a campaign that helped establish a 1975 state law, which legalized acupuncture and regulated the licensing process in New York, grandfathering in current practitioners. Dr. Ding had strong political ties to former Lt. Gov. Mary Anne Krupsak, State Judge Edwin Margolis and State Sen. James Donovan. When Dr. Ding died of a sudden heart attack at a restaurant table, Dr. Jin was the first one called there. “When I saw him lying in the mortuary the last time, I knew, his things were not done. I must carry his mission on. I must do all I can as a human,” she said. On the other side of the dispute is Ling Zheng, from Fuzhou, China, a licensed acupuncturist who is the secretary of the medicine society, which has 700 members, most of whom are younger and trained in modern oriental medicine schools with western medicine knowledge. He has worked at his small office at 14 E 34th St. since 1996. He is famous for his expertise in arguing with, and sometimes suing, all sorts of insurance companies to get paid. (A typical acupuncture may cost from $100 to $200.) Zheng said that two-thirds of his patients did not need to pay cash, a rare situation. He shares all of his tactics for dealing with insurance companies with members of the medicine society, for free. But he does not do the same for members of the united alliance. For centuries, Eastern cultures have known the value of acupuncture. The earliest recorded use of acupuncture in history occurred in China over 2,200 years ago. Modern scientific research has not been able to fully document how acupuncture works. According to U.S. National Center for Complementary and Alternative Medicine reports, for which Dr. Tian Xiaoming and his team interviewed over 1,700 doctors and patients, acupuncture is effective for at least relieving pain and nausea. The way it works: Acupuncturists insert their power through needles into certain points to remove blockage of the flow of Qi, the inner vital energy, and to reach a balance of contradictory forces of Yin and Yang. Dr. Roger Tsao, 68, from Taiwan, who never went to a formal acupuncture school but has acupuncture licenses from the states of California, Florida, New Jersey and New York, has been practicing acupuncture in New York since 1969. When he started the business, many acupuncturists dared only to treat horses and dogs. Dr. Tsao, who is bilingual, once participated or collaborated with almost all acupuncture. He was one of the 11 members of the New York State Board for Acupuncture from 1999 to 2004. But now he has quit everything. “I’m tired of seeing Chinese people fighting each other for positions and titles,” said Dr. Tsao. “I’m too old to bear with that. They only want to kick you off and be the boss. But they never ask if they are good enough to be the leader. Currently, Dr. Tsao works as a part-time professor at the Pacific College of Oriental Medicine, which is the largest school of Traditional Chinese Medicine in the nation. Over 70 percent of students are American, paying tuition of about $250,000 in a degree granting program that takes three and a half years to complete. In 1972, President Richard Nixon visited China and officially opened the gate for acupuncture. This entry was posted on Friday, October 28th, 2011 at 11:18 pm. It is filed under Featured, Midtown West, More Stories, Pulse and tagged with Acupuncture, Acupuncturists, Bill Cosby, Health, Insurance, New York, Oriental Medicine, Traditional Chinese Medicine. You can follow any responses to this entry through the RSS 2.0 feed.